Beautiful Cabin Vacation Home on the river, mountain views, double decks, minutes to skiing in Breckenridge, Colorado! Beautiful Newly Built Cabin on the river, mountain views, double decks, minutes to skiing! We have what you need to start that vacation! Whether your looking for something small and cozy, rustic, or remodeled and great for larger groups! Even the furry family members are welcome at a few select properties! Escape to the heart of the Rocky Mountains when you book a trip to this comforting 2-bedroom plus a loft, 2-bathroom Breckenridge vacation rental cabin! Offering sleeping space for 8 guests, high-end amenities and a mesmerizing mountain location, this Colorado home as it all. From the moment you arrive at this superb alpine property, you’ll know you’ve made the right choice! This elegant Breckenridge cabin is perfect for the family getaway or a couples retreat in the Colorado wilderness. The rustic interior includes tastefully appointed decor, sleek hardwood floors and a cozy stone fireplace in the comforting living room, as well as an expansive kitchen fully equipped with all the necessary cooking gadgets. 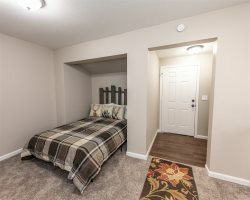 The property also provides many alluring modern comforts, such as central heating, heated bathroom floors, a gas fireplace, complimentary toiletries and an in-unit washer and dryer. After a day spent exploring the great outdoors, hiking, skiing or whatever you desire, unwind in style back at the property! Kick your feet up in the living room to read a good book, cozy up around the fireplace, or laugh over stories of the day’s adventures with your loved ones. After a long day exploring and playing, take a dip in the indoor community pool and make a splash or soak in one of the two hot tubs! After you have dozed off in the master bedroom to the sound of the river right outside your door, head outside to the private patios, grill up some food and gaze out through the peaceful tree-lined views to see the immense mountains looming in the distance. Challenge your pals to a game of foosball, table tennis or arcade games at the community rec room! Cap your night off by soaking up some jetted bubbles in the community hot tub for a soothing way to end the day. Tiger Run is a secure gated high end RV Park located between historic Frisco and World Famous Breckenridge Ski Resort. We have unmatched views of the '10 Mile' mountain range. Tiger Run is truly a one of a kind with secluded and private cabins bordered by the Swan and Blue rivers. Our stay was wonderful and relaxing. The check-in and out processes were easy and the information we had prior to our stay was helpful and put us at ease. We had very clear instructions for everything. We will very much consider staying again in the future. Really enjoyed our stay. More than enough room. wish we had more days to spend there. Decks were really nice. Lloyd very helpful with last minute check-in issues. Easy access to Frisco and Breckenridge. The views, amenities and location were great. Communication was good and would for sure stay again. We enjoyed our stay! The Tiger Run location is well kept and the amenities were great. Our kids loved the large pool, arcade, and outdoor basketball hoops. Our cabin was very clean and updated. Great place to stay! We had the best time relaxing and enjoying all this property had to offer. Hiking, fishing, views, quite friendly private community, and wonder relaxing deck right on river! Great value for the price. Beautiful resort close to Breckenridge. Breck, Keystone, A-Basin, and Copper all within 20 minutes of this gem of a cabin. Gorgeous vacation rental. Would definitely stay here again. Family of four loved the cabin, great location as we skied Breck, Vail and Keystone. Very quiet in a gated community. The cabin is exactly as pictured! It's really clean and cute. There is plenty of supplies and extras in the kitchen. The beds are super firm, they could use a memory foam pad to make them more comfortable. The club house and hot tubs are a let down! One of the tubs was so hot, it couldn't be used so everyone was in one tub. Also, since the cabin is in a RV park there are a lot of people using the locker room to shower so it was very crowded. Overall, the park model was nice and just as pictured. Great renter to work with a fabulous community to spend your time in on vacation. Loved every bit of it!!! This cabin is beautiful. The way it sits on the river, the log exterior, the heated floors in the bathrooms, tile floors, the fireplace all adds to the relaxing mountain escape vibe. It fit our family of 8 adults perfectly well. We spent most our time out on the deck enjoying the sound of the river. A perfect get away! We enjoyed the cabin. The two level deck with the view of the mountains is awesome. We would book this cabin again. My family (2 adults, 3 teens) thoroughly enjoyed this cabin for our spring break vacation! The property is in a great location, and, being new, everything was fresh and clean. Everyone had their own memory foam queen size bed, and the bathrooms had great showers and heated floors. There were lots of nice extras provided, including plenty of towels, extra blankets, and a well stocked kitchen (including a big set of plastic food storage containers, which aren't always available at rental homes). We were surprised to find a beautiful 2-level, covered and lighted deck, which also provided a full outdoor dining set. We enjoyed our afternoons at that table, watching the colors change over the mountains as the sun set. Lloyd was very easy to work with and always responded immediately to our requests. We highly recommend this property and will keep it in mind for our future vacations as well!